Papaya is a beta-carotene-rich food filled with powerful enzymes and phytochemicals that are good for skin. The enzymes slow down the formation of fine lines and wrinkles by combating free radicals. The secret beauty nutrient in papaya is papain, an enzyme that has skin-lightening properties and can reduce the visibility of blemishes and acne scars. Together with alpha hydroxy acids, papain acts as a gentle exfoliator that dissolves inactive protein and dead skin cells. Applying papaya topically to skin will soften your skin, leaving it smooth and supple. Heals dry, flaky skin. Reduces visibility of acne scars and dark spots. Smoothens out aging skin. Boosts collagen production. Promotes skin elasticity and firmness. Promotes skin regeneration. Contains anti-inflammatory properties that heals conditions such as acne, rosacea, and eczema. Exfoliates skin. 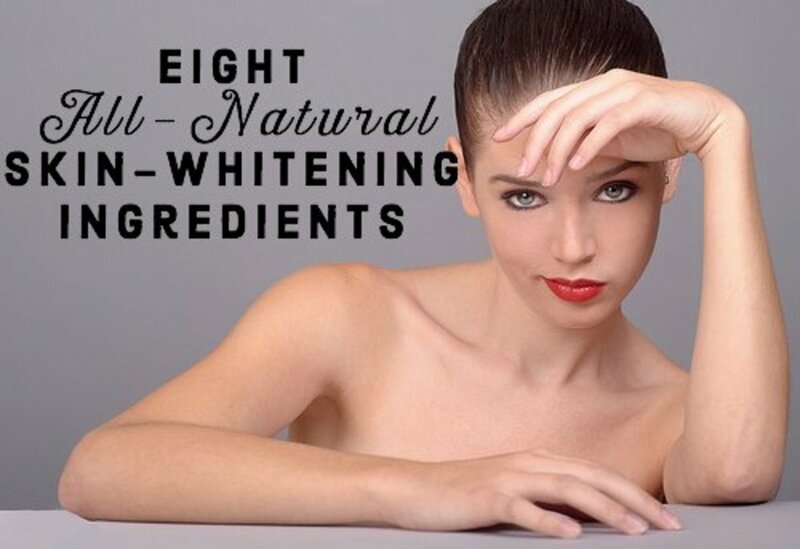 Lightens skin tones and decreases pigmentation. Acts as a skin softener that smoothens out rough skin and clears acne. Exfoliate skin by breaking down bonds between dead cells. Hydrates and moisturizes dry skin. 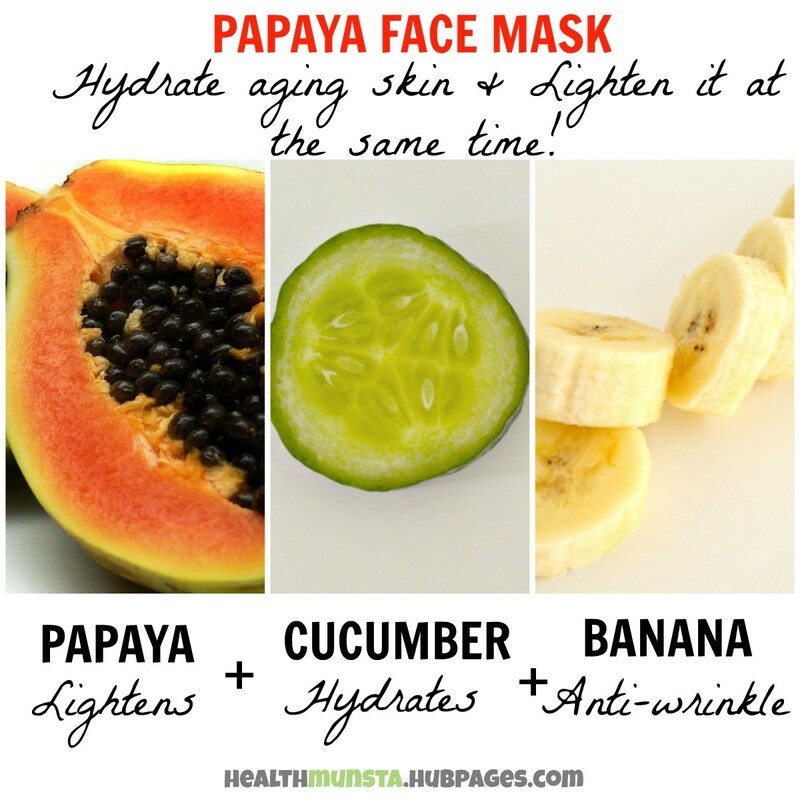 Before looking at the recipes for these three simple homemade papaya face masks, please ensure you don't use papaya face masks if you have sensitive skin. The enzymes and alpha hydroxyl acids may irritate your skin. Always use a test patch on your inner elbow to confirm if the face mask ingredient is okay for your skin. Want to get rid of pimples or acne scars? Then this papaya, honey, and lemon face mask is the right one for you. 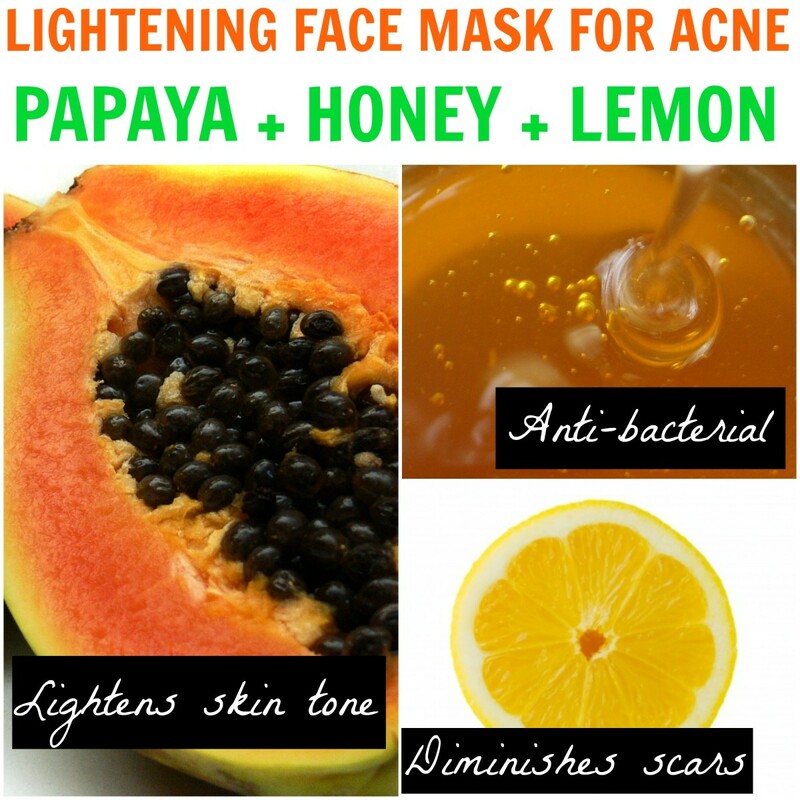 Papaya, honey, and lemon all contain antibacterial properties that will kill off acne-causing bacteria from the skin. Papaya also has a deep-cleansing action that will push out all the gunk from clogged pores. Hydrates and softens skin. Gently exfoliates skin cells while preserving moisture. Has antibacterial properties that stave off acne. Fades blemishes and evens out discolorations. Acts as a natural astringent. Tightens large pores. Kill germs on the skin's surface. Deep-cleanses pores and refreshes skin. Use freshly squeezed lemon juice to make this face mask. Do facial steaming before hand to open up your pores. 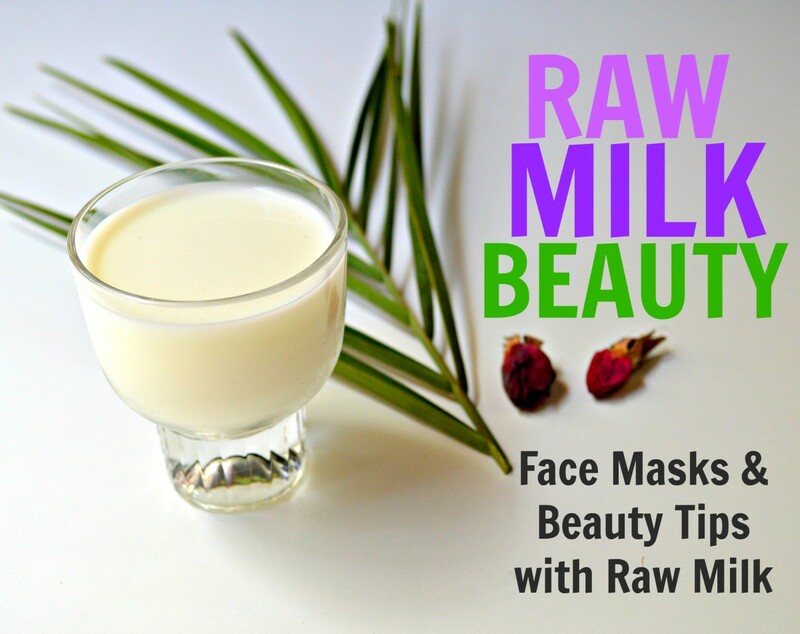 This will allow the face mask to penetrate deep and nourish your skin cells. Use raw honey for best results. Processed products will contain additives that can irritate sensitive skin. Blend or mash up the soft ripe papaya into a lump-free puree. Add the honey and lemon juice and mix well. Apply the face mask onto your clean face and let it dry for 15 minutes. When the time is up, gently use warm water to loosen the face mask. Do a final rinse off with cold water. Pat your face dry with a clean towel. 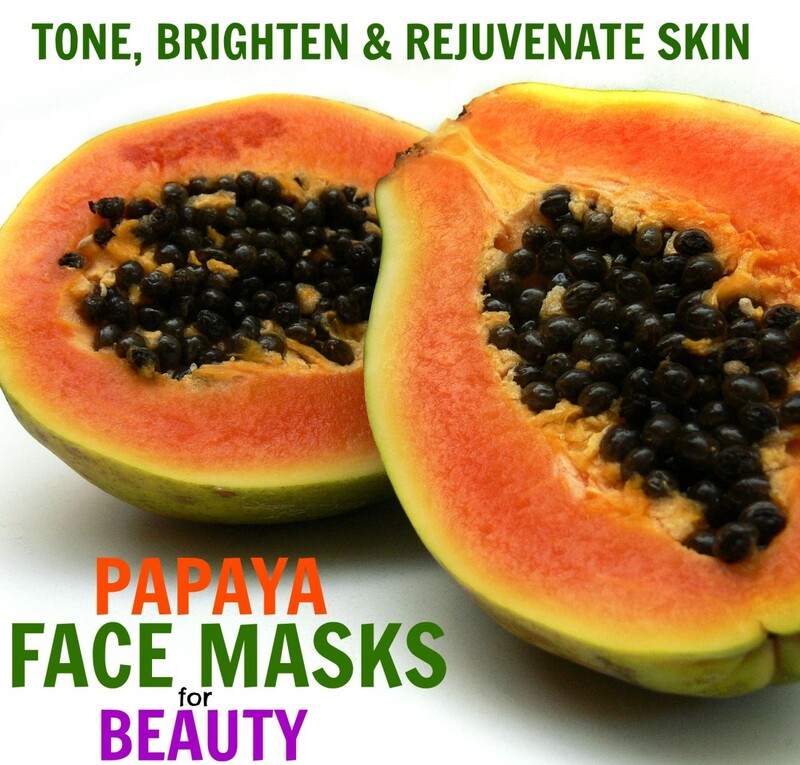 For a soothing and refreshing feeling, use this papaya, cucumber, and banana face mask. Papaya is good for reducing pigmentation, cucumber will soothe sunburned and inflamed skin, and banana will hydrate and soften rough skin. Hydrates, moisturizes, nourishes, and cleanses skin. Has skin-lightening properties that help fade blemishes and acne scars. Soothes and relieves inflamed acne and sunburn. 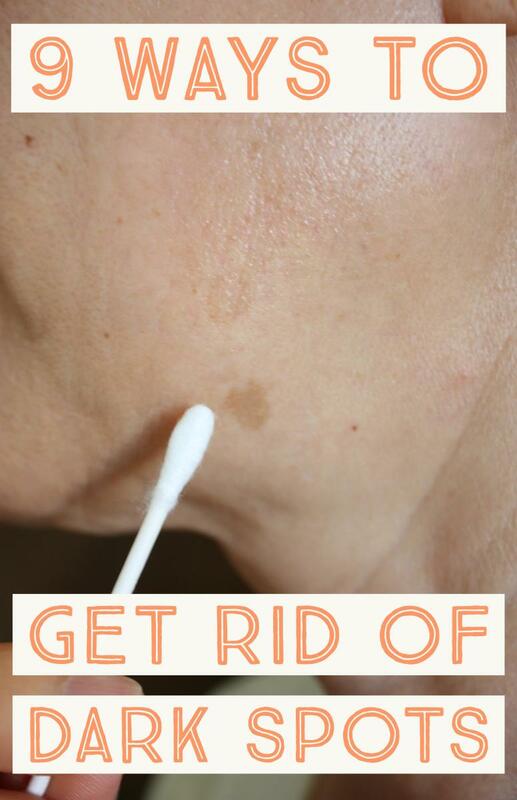 Smoothes and reduces wrinkles. Hydrates and moisturizes. Promotes glowing, youthful skin. Wear an old T-shirt or an apron to prevent the face mask from dripping onto your clothes. Apply the face masks over your kitchen/bathroom sink to avoid messy drips on the floor. For best results, use a ripe or overripe banana and papaya. Peel and blend all ingredients in a blender until you get a smooth puree. Slather the mixture onto your face, avoiding the areas around the eyes and mouth. Let it sink in for about 15 minutes. When the time is up, first use warm water to loosen the face mask. Finish rinsing off the mask with cold water. Pat your face dry with a clean towel. 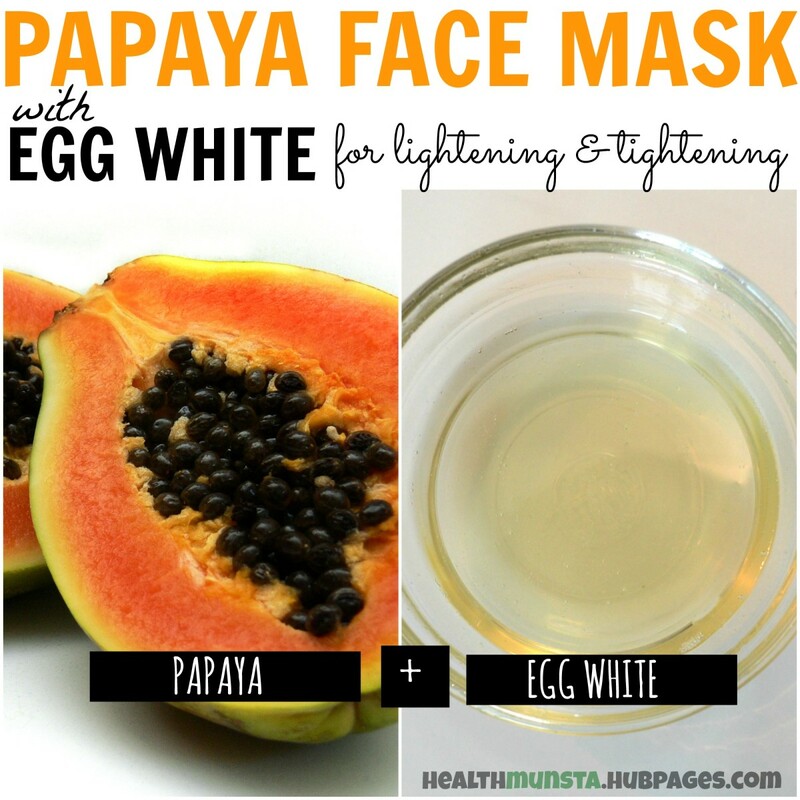 Papaya and egg white both help tighten pores and control sebum. Egg whites work wonders for people with oily skin (though if you have dry skin, you're better off with an egg-yolk face mask). Removes excess sebum on skin's surface. Prevents acne and pimples. Tightens skin pores hence giving skin a firm as well as youthful look. Avoid applying the face mask near your eyes and mouth as the skin here is thin and is more prone to fine lines and wrinkles. Excess face mask mixture can be stored in the refrigerator for up to 3 days. Gather your hair away from your face into a ponytail and wear a headband to protect your hair from the sticky face mask. Peel the papaya and blend it into a smooth puree. In a small mixing bowl, whisk an egg white until it turns frothy. Add the papaya to the egg white and mix well. Apply the mixture onto your face. Let it dry for 15 minutes. To loosen the face mask, gently scrub it with warm water. Rinse with cold water to close pores. I have under eye circle, please recommend a face mask to clear it out. The papyaya and other ingredients just roll off my face anytime I try this . We all know that papaya is delicious to eat. But, do you know it can be used to treat dengue? Packed with nutrients, papaya reduces inflammation and fights diseases. there are pimples on the face i suppose this newsletter will help. 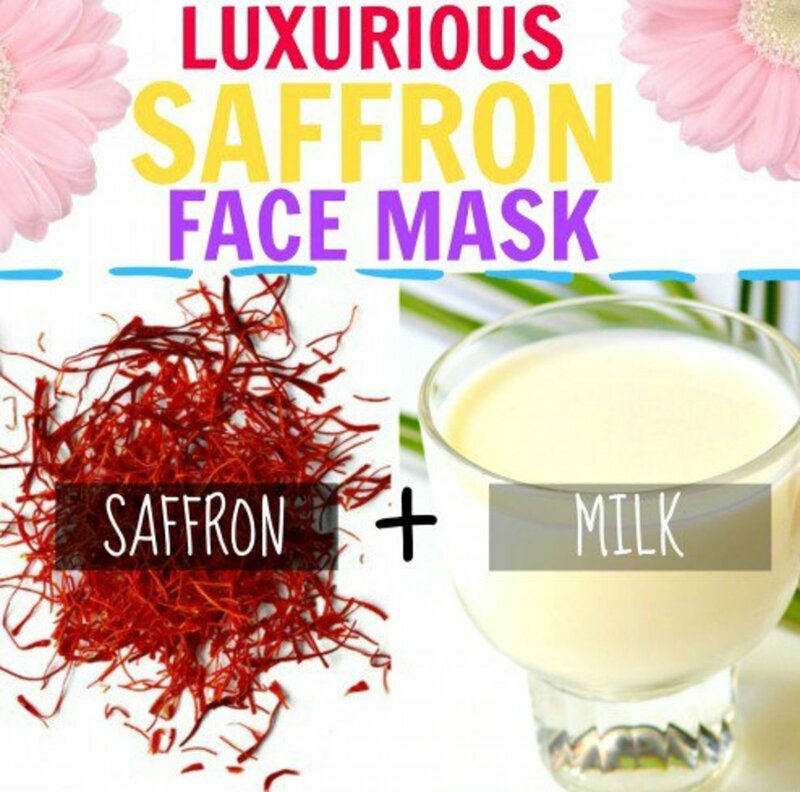 Wow it is excellent fack mask with homemade natural sources. I tried it many times. It works awesome. All should try. There are pimples on the face I think this article will help. Healthmunsta is a great gift to mankind. While most people monetize beneficial information, the face smoothening solution discussed here is free of charge. You have wonderful masks! Could I ask you for a favor? Would you be willing to research and come up with a series of beauty masks for vegans? I am a vegan and although I admire the results of an egg mask, for example, I cannot use one. Thanks for considering a sector of your readearship that cannot participate when you use certain ingredients! How often should I apply the mask? Use papaya daily dat z very effective..not ly applyn jus tak piece of papaya daily..drink more water...yu ll see a good result..
You will be amazed at how the papaya is related to money. I have face lines on ma face. So wat can I use ? Papaya is too good for making our skin flawless and white. 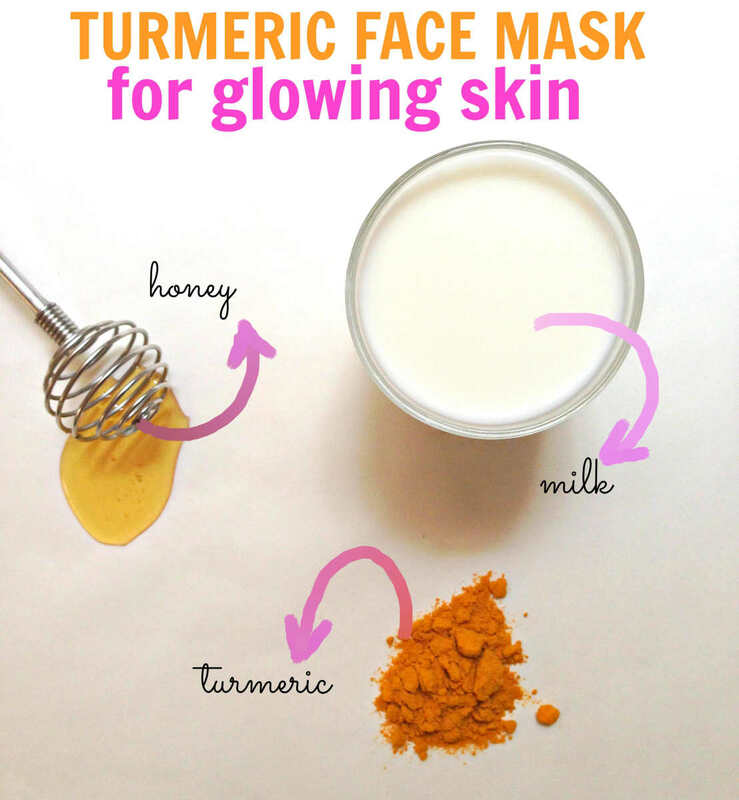 It can work wonders for making our skin glowing if used daily. Papaya juice with lemon juice is very effective in ironing out facial blemishes.